You might wonder what in the world a lightweight fry pan and tenkara have in common. They may seem totally unrelated, but in fact (in my world) they are tightly connected. Bear with me, because tenkara and backcountry cooking keep me busy! Well over a decade ago, my good friend and frequent wilderness companion, Patrick Smith, gave me a 5-ounce, 9" cake pan he bought at King Soopers. I'll bet he didn't pay over three dollars for it. Well, that pan, forevermore called the "fish pan", has cooked up literally hundreds of trout, made-from-scratch biscuits, sliced elk tenderloin, freeze dried hash browns, sausage patties, dried eggs...you name it. It's been dented, scorched, washed with sand and creek water, and hauled all over creation in my backpack. It was a really good pan. However, it lacked a few things...durability, a fitted cover, and the ability to bake. Enter the Banks Fry-Bake Pan. I had been researching a replacement for the venerable fish pan for quite some time. One day while I was actually doing some browsing online about backpack cooking, I stumbled upon the Banks Fry-Bake Pan. As soon as I read the specifications and reviews I knew I had to order one as soon as possible! To my surprise, there was also a good amount of information out there about cooking with it, including recipes, in the fine little book entitled "NOLS Cookery", produced by the National Outdoor Leadership School (NOLS) and published by Stackpole Books. The Fry-Bake Pan is a cornerstone of NOLS' bacI kcountry cooking program. The Banks Fry-Bake Pan comes in three different sizes - an Expedition (10.5" X 2" deep), an Alpine (8" X 1.5" deep), and a Deep Alpine (8" X 2 3/8" deep). Each comes with a close-fitting cover specifically designed to hold hot coals or charcoal on top for baking. Since most of my use would be for backpack trips and guiding tenkara trips with a large day pack, I chose the smallest and lightest pan, the Alpine. Total weight: Less than 12 oz. Standard and NOLS-Style Alpine Fry-Bake Lids are spun from .050” 1100 “O” temper aluminum and weigh less than 5 oz. The Standard Lid has an “L” shaped tab for lifting riveted with 2 rivets to the lid. This tab has a small hole in it to allow for insertion of a stick, “O” ring or “S” hook. The NOLS-Style Lid has a wingnut installed with a bolt through a single hole in the center of the lid. This style is the easiest to customize with the addition of your own knob or handle for lifting the lid by replacing the wingnut. The Lightweight Lid is spun of .040” 1100-0 temper aluminum and weighs less than 4 oz. The Lightweight Lid has a wingnut installed with a bolt through a single hole in the center of the lid. Since I planned to use my new pan mostly for backpacking and guiding, and every once would count, I selected the lightweight lid. As with most really good gear, the Banks Fry-Bake Pan isn't cheap. I ordered my pan from the Banks website, and ended up spending $72.70, including shipping. However, after using this pan for the past few months, I can safely say you truly get what you pay for and it's worth every penny. After I got my new pan, my buddy Eric Lynn, who owns Mountain Ridge Gear, sewed me a custom cover for it. He even surprised me by fashioning a deer antler knob for the lid. Thanks, Eric! I've used my Fry-Bake pan in various ways. One of the really cool things I've done is baked pizza in it, and although I didn't use hot coals on top of the lid yet, baking pizza with only my old MSR Whisperlite Internationale stove worked just fine. Getting ready to bake pepperoni and cheese pizza in the Banks Fry-Bake Pan. I've also been using my Fry-Bake Pan for cooking up hot lunches for my clients on the tenkara trips I guide for Royal Gorge Anglers. 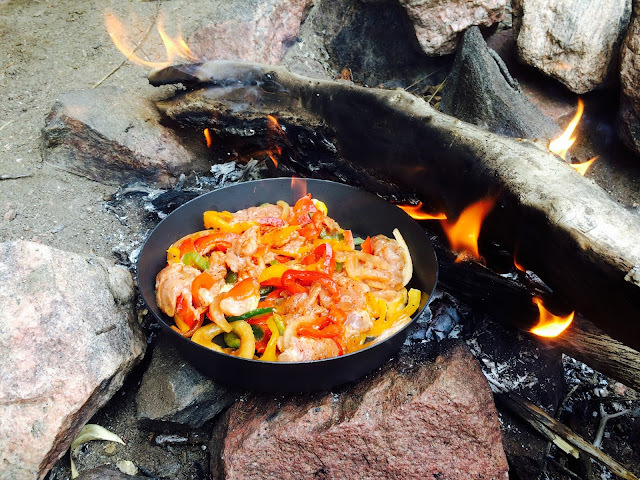 Whether it's a drive-up trip along the Arkansas River in Bighorn Sheep Canyon or an all day hike-in backcountry trip in the canyons, I always cook a hot lunch. So far I've done bratwurst on my Coleman stove, and both pork and beef fajitas in the backcountry. One day I even put the Fry-Bake Pan directly on hot coals to sauté fajita meat because of a forgotten fuel bottle for my stove. The pan has worked well for all of this! Pork fajitas, cooked on an open fire. Hot meals in the backcountry are always a big hit with my clients! Breakfast sausage cooked on top of a Kifaru wood stove. Cooking up bratwurst on my Coleman stove. Beef fajita mix, using my old MSR Whisperlite Internationale stove. Well, there you have it. The Banks Fry-Bake Pan. It's a great piece of bombproof, simple gear that'll outlast its owner! I hope you have a chance to try one of these pans out...happy cooking! Tenkara Bricolage: Trade Shows, New Guide Trips, Alaska, and More! As a fifth-generation Coloradan growing up just outside the Mt. Evans Wilderness southwest of Denver, I learned to love wild country and wild trout at an early age. I've spent a lifetime backpacking, fly fishing, hunting, and backcountry skiing some of the most spectacular country anywhere. Tenkara fly fishing combined with lightweight backpacking is my passion! I am a professional tenkara guide based out of Canon City, Colorado. 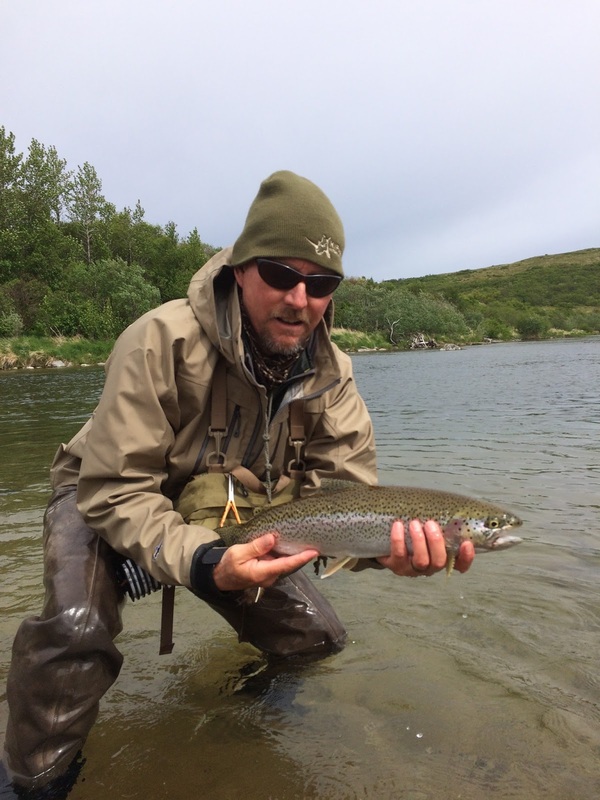 I am pleased to be guiding tenkara-specific trips for Royal Gorge Anglers, specializing in remote backcountry adventures, Arkansas River and South Platte trips, and hosted trips to southwest Alaska. "Tenkara is the traditional Japanese method of fly-fishing where only a rod, line and fly are used. Tenkara is about fly-fishing simplicity and mountain-stream effectiveness. Eleven to fourteen foot long rods allow anglers to fish mountain streams in a way that is nearly impossible with western fly gear. Telescopic rods collapse down to a mere 20 inches, and few things are needed making tenkara ideal for backpacking. Tenkara is perfect for those in search of a pure, effective and simpler method of fly-fishing." 10th Mountain Division Hut Assoc.